Now well into the second year of his presidency, the once very popular president Macron is seeing the youngsters in France turning against him. 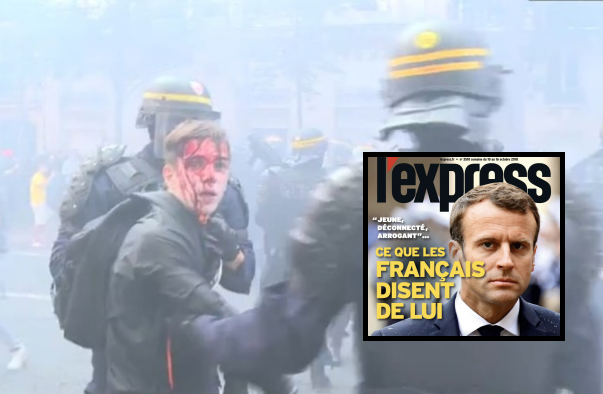 The leftwing unions have announced today that they would be pressing legal charges against the riot police in Paris who left many wounded after the French capital saw major protests against the labor reform policies that Mr. Macron’s government is trying to push through parliament. Mr. Macron has been trying for well over a year now to get the agreement with the unions to try and reform the labor laws, designed to bring greater flexibility to the jobs market in France. Many blame him for refusing to compromise with them. The president battles sagging popularity on the back of those sweeping reforms as unemployment remains just above 10%. Related coverage: <a href="https://thegoldwater.com/news/38566-France-Macron-Loses-Political-Father-Interior-Minister-Collomb-Over-Security-Scandal-Video"> France - Macron Loses ‘Political Father’ Interior Minister Collomb Over Security Scandal (Video)</a>. The marchers, who counted some 160,000 all over France and consisted mainly of young people said they had enough of “austerity, unemployment”. Their biggest concern that is that Mr. Macron’s proposed welfare reforms will “disadvantage the weakest in society”. Protesters accuse the former Rothschild merchant banker of being a “friend of the rich” who attempts to break down hard-won workers’ rights, essentially turning France into another Britain or America as Thatcher and Reagan did respectively in the last century already. French workers meanwhile try desperately to hold onto their rights. Macron is a (((globalist))) patsy. Protesters accuse the former Rothschild merchant banker of being a “friend of the rich” who attempts to break down hard-won workers’ rights, essentially turning France into another Britain or America as Thatcher and Reagan did respectively in the last century already. French workers meanwhile try desperately to hold onto their rights. ← WTF!!!! Capitalism is working very well here in the USA. If we eliminated the lousy unions we would be in even better shape. Socialism is a disease that has never worked out long term. The protestors should embrace the American way if they want to crawl out from under the shitshow. The proof is 250 years of America the great! !